I took some time this past weekend to get my foundation pages in order for December Daily® and I'm happy to share them with you today. 1. Organize my page protectors. I use the term "organize" loosely as you'll see: I laid each of the four designs out on my table and put them into the album in this order: full 6x8, 4 pocket (3x4), 2 pocket (4x6) and then the 3-pocket one (4x6 and 3x4 combo). You'll run out of the 3-pocket first and then the 2-pocket next. Once I ran out of those two I just put the rest of the full page 6x8 and the 4-pocket in the back of my album. I want some flexibility. I want to decide I want another 6x8 page for my story today. The order of the page protectors really isn't super important in the long-run (and can make some people more frustrated than others). Also, as you'll see in the video - I have quite a few left over that I'm just keeping at the back of the album to work in during the month if/when I need them. 2. After I got the page protectors in the album I simply began the process of getting a number on most of the pages. I mixed in the December Daily® 2014 Overlay Combo pack with the wood veneer numbers (I embossed those in white) and the big gold numbers (+ a couple others as you'll see below). 3. I cut the three transparencies in half and am using them as fun dividers. I'll probably move them around during the month so that they go with stories I might be telling, but I might also just leave them right where I have them now. I used the Crop A Dile to punch holes in the sides (use a page protector as your guide) and then I folded over the sticker tabs and stapled them in place with a Tiny Attacher. NOTE: There is a "film" - basically a plastic layer on top of the transparencies that you should pull off when you are ready to work with them. 4. After that I really just started playing with paper and numbers and embellishments as you'll see below. On the cover of my album I added a gold letter "E" for Edwards using red line tape. I embossed the wood veneer numbers using white embossing powder (mine has been contaminated by gold glitter from a previous project so there's a few flecks included here and there). If you want to learn more about embossing I showed how I do it in my Foundation Pages video last year. The first page of my album for 2014 is a "reason why" page which is a great way to begin an album like this. Why are you participating in this project? What is your reason why? You can handwrite or open the 6x8 PNG in Photoshop and type in your words. Above "the reason why" I added one of the glitter stars and below I added the December Daily rubber banner (adhered with red line tape). The package includes PNG files and printable PDF files of "my reason why," "our reason why," and "the reason why" so you can choose which one fits best for your own project. CLICK HERE TO DOWNLOAD THE REASON WHY PACKAGE. I printed mine on Epson Matte Presentation Paper. I can't wait to read your reasons why. After my "reason why" my album begins with December 1. For December 1 I included a 6x8 overlay printable (these can be printout out like this or added to your photo in Photoshop). If you are adding pattern paper strips to the printables, the size on the 6x8 that worked for me was 4.5 inches x 1.25 inches. On top of the green and white pattern paper I stamped using red ink + the strip of stars on the stamp set. Here's the first of the transparent pages that I cut in half. To the middle edge of each I added the small word tab stickers (folded over) from the kit and stapled it in place with the Tiny Attacher. I punched holes in the transparency using the Crop A Dile. Don't forget to pull off that "film" before attaching the tab. For Day 2 so far I've included the "All I Want For Christmas" card (I stamped those numbers on there using stamps from the kit + Gray Flannel Memento Ink) + a gold glitter tree + a red plastic star + the embossed #2. On the back of Day 2 I started Day 3. Behind that gold glitter tree I cut pattern paper to fit and adhered it + a cute little puffy heart (from the kit). On the Day Three card I stamped "the story of today" three times. Day 4 includes the pink-border 4x6 card + the star circle stamp + an embossed #4. For Day 5 I used the gold glitter to emboss two stars from the stamp set. Here's the second transparent insert - love these ombre dots. Day 6 is starting with a pocket full of tissue confetti circles + the plastic word twinkle + a plastic star + a few random gold sequins I had laying around. This pocket is going to be stitched closed, along with the #6 pocket, when I complete that day. I want to leave it open in case I want to add something else (or emboss the back of the #6). I added one of the gold glitter stars to the "o" of "more." This is one of those places where I'm leaving a little room to play during the month (no date set on the page opposite). Day 7 is an overlay + some of the orange triangle pattern paper + stamped "make merry" at an angle. Day 8 is currently just the number 8. I did emboss the back of the gold 8 - thinking I will probably do that for the other numbers. I like the back with the white vs. the plain chipboard. You can also simply back those numbers with a pattern paper - I just like the idea of keeping some of these pockets see-through. I'm using that fun number page for Day 9 - thinking I'll stamp "remember this" at the top left and then hand-write the things I want to remember from that day along the edge there. Or not. Just an idea to consider. Behind Day 9 I added this star pattern paper - not sure what I'll add to it yet but I like it. You can also see the next transparent divider was added here - no rhyme or reason - just spreading them out within the album. For Day 10 I've started with a pattern paper 4x6 sheet + the masking tape + embossed #10 + a bit of red stitching. Day 11 so far includes a 4x6 printable + pattern paper + acrylic star + a mini silver brad. I like to use Tim Holtz's Retractable Craft Pick to go through shapes like this (and chipboard) before putting the brad through. I painted the random circle chipboard page using Martha Stewart Summer Linen Satin. It took about three coats to get it to this consistency. My plan is to use this for Day 12 since there are 12 holes - most likely I'll add some of the chipboard shapes and/or photos or words. My initial plan is to print out a photo to cover up the back or I might just paint the back as well. I'd like to maintain some of the transparency of the holes so I'll be thinking of a way to work around that on the 12th. I haven't totally tackled the other two chipboard sheets that are included in the kit. I did decided to paint over top of the calendar sheet (same paint as above) and I'm thinking I'll cut that one up and use as insert pages at some point during the project. Day 13 so far includes the gold numbers adhered to the pinecone pattern. Above it I added one of the bokeh transparent stars + a gold glitter heart + a silver mini brad on top of the red stripe pattern paper. Behind that bokeh star card I added a simple card that includes a gold glitter star + the stamped star circle + some of the orange pattern paper cut and adhered along the bottom. Day 14 includes a 6x8 overlay with a piece of that cute lightbulb pattern along the bottom. I stamped "remember this" using the kit stamps. Following that page is the full page "let there be peace on earth" - I followed what I did before on that other full page text page and added a gold glitter star in the middle of an "o." For Day 15 I created a card that includes some of the blue striped pattern paper + the grey star pattern paper + stamped red stars + stamped "make merry" + red stitching + the #15 embossed. Day 16 features a portion of that 6x8 star page + the number 16 stamped in red using stamps from the kit. 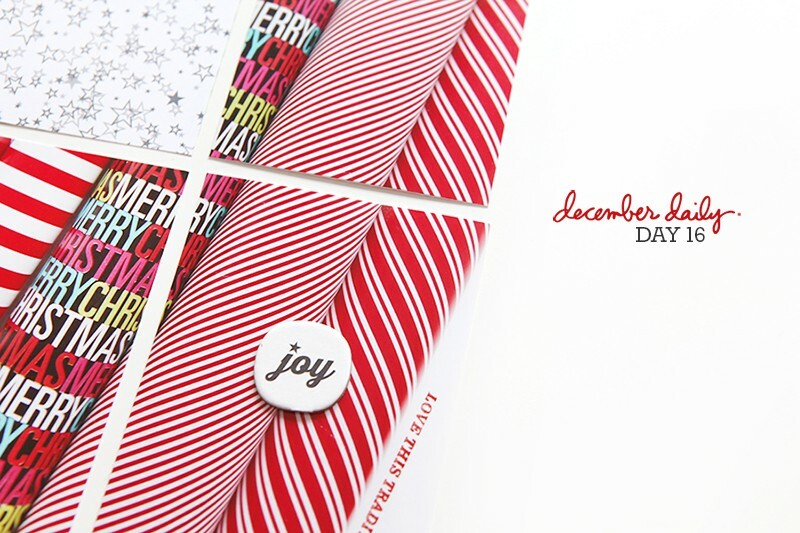 Day 17 includes a 3x4 overlay + red pattern paper + red stitching. You can also see that I added the second star transparency insert here as well. Next to the Day 17 card I cut out "merry happy everything" from the black background and added it to the pocket (love creating see-through opportunities). That's Heidi Swapp Sweet Cherry Color Shine sprayed on top of the start pattern paper. I stamped "tis the season" from the kit stamp set and then embossed the 18 before adhering. For Day 19 (still need to do the number) I wrapped some of the printed masking tape around the card and then paired it with the star pattern paper. I also added line of red stitching there. Day 20 is a white sheet of paper + the "2" and the "0" from the postage stamp sticker set + the story of today stamp. Day 21 features a 6x8 overlay + green striped pattern paper + "let your heart be light" stamped in green and grey. I've also included the red dot transparency here with the "joy" tab stapled in place. For Day 22 I've started with a 3x4 card (that cute little tree) and then added a gold glitter star + the embossed 22 + a stamped "happy christmas." Day 23 currently features an overlay card + a gold glitter triangle/tree + a red plastic star + a mini-brad. The last 1/2 of the transparency is included here. For Christmas Eve so far I just have the 24 in the pocket. My plan is to stitch them inside. All I have for Christmas Day right now is that awesome big gold foil 25. I'll likely include more page protectors for Christmas Day since we tend to have more photos on that day (and like I said there are quite a few left-over to choose from). After the 25 I've got the large 6x8 Merry Happy Everything page included for now. I might end up moving that around based on the earlier days or I might use it as a closing page for the album. I put together a video overview of the album that repeats a bunch of the things I outlined above. 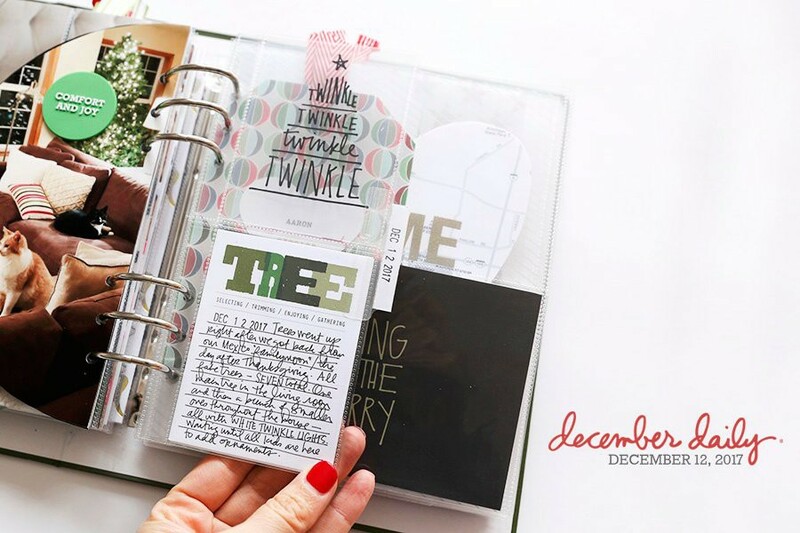 December Daily® 2014 | Foundation Pages from Ali Edwards on Vimeo. Just "WOW" ... you hit it out of the park again. And thank you for the list of additional supplies. Happy Thanksgiving. Thanks for sharing. Looks like so much fun!! Can't wait to figure it out for my own, "December Daily, Yeaterday and Today". Going to try to tell some stories of Christmases past while documenting this Christmas. Lots of changes in my family.... Kids grown and gone or leaving, my divorce settling in, and quite possibly the last Christmas we spend in our house. Christmas is much different without little kids, sometimes it is hard to see the celebration. So hoping to include some memories and stories from through the years. So wishing I had done this every year while the kids were growing up. Merry, Merry!! Awe...LOVE your thoughts on how you will tackle your DD!! I can SO relate to you on how sometimes it IS HARD to see the celebration. This year for the first time in a LONG time we will have little ones joining our family celebration and we can't wait!! Twin boys that will be 17 months old....should be a FUN time. Have a nice holiday season! I love your idea for your album. Christmas can be hard without kids around. My husband and I live in a different state than both our families, and we don't have kids. This year we are not traveling to visit them. I've found this project helps me to celebrate the season and also to find simple things to appreciate about the season. Sometimes I do include stories about past Chritmas'. What a cool idea to take a Yesterday and Today type approach! Love the idea of past mixed in! Especially since this is my first DD and our family's first year without a special family member and feels weird not to include her somehow as she will still be with us in our hearts. I'd love to see what you do. Awesome!!! Thanks so much for the great word art! Wow! Beautiful! Can't wait for my kit to get here & start playing! And obviously it looks awesome! I've sat down with my kit a couple of times and there's just so much! Looks like I'll be able to spread it between DD for this year and PL. Yay! Another second for the photos plus the video - great to have both options to view! Beautiful! And thanks so much for the brushes! As always, I leave your blog uplifted and inspired. I can't wait to finish working on mine now. Do you think it's possible to paint the cover? I wanted to paint white stripes on the album so it would match the box but I'm not sure if it will work. What are your thoughts? I am painting mine a little bit darker red and they suggested Martha Stewart Fabric Paint to me. Hope this helps! Fa La La La! So gorgeous! And, thank you for the "reason why" template! It's actually my favorite part of the project - writing out why I'm doing this and what I hope for. Thanks again! Thank you so much for sharing! As a visual learner, seeing your design makes me really excited for December to roll around! As always, I love your creative use of the kit this year. You help me think "out of the box" in terms of using the goodies in the kit. I am pleased with the wealth of stuff and can't wait to get started. Thanks Ali! p.s. Thanks for the free download! i don't like to complain... because i adore you ali & have been a fan for a looong time and have been more than satisfied with all your products and classes... just felt i needed to express this. hi! I don't know if this will help but on the SC boards they were asking people to start a conversation if you were concerned about the color. Not sure what they are doing for customers but I thought I'd pass that along in case it helps. I totally agree about the album cover. It looked like an autumnal color not Christmas red. I ordered it before an actual picture was displayed just the mock up which was Christmas red not a cross between a pumpkin orange & mauve color. I hate to complain as well because I love Ali but this is false advertising. There should have been a disclaimer that if you order red it will look like pumpkin orange/mauve color. If you want true red, christmas red then you might want to consider the other option cream. Now I have a kit but no album since it is a hideous color. I'm either going to have to trash it & buy another album or completely wrap the album some how. :( At least it's not a total lost, I do love the DD kit itself. I just wanted a red album to match the DD box. @audmac - I think there was a misunderstanding within your conversation. We are looking into it for you and they should respond back to you soon. I thought I had ordered the off white, but by mistake ordered the supposed to be red coral color album and started a conversation...I was told that you can exchange your album, but would be charged for the shipping. I am changing mine to a darker red. It was suggested to use Martha Stewart Fabric Paint for this. I am going to give it a try! don't feel it is my cost to incur because "they" described it as "RED". ali, thank you for always responding... LOVE all the content in the kit! I have been told it is $12 for shipping to exchange for off-white. As those gals above, I am a loooong time fan and loyal customer of both AE and SC. But.......but.......an insipid salmon-colored Christmas album? When I was excitedly expecting a deep red one? Yuck. I put in a question/complaint on Friday when I received the package and still haven't heard back. Another "conversation" was initiated just now as well. I really hope I'm not expected to pay even more to get what I already paid (quite a bit) for already. Thanks, and I am looking forward to playing along for the 8th year! I was right. You took all those busy beautiful supplies and used them in a clean, neat, but gorgeous and cool manner. Thanks for sharing your skills! I have direction now and can't wait to get started. Great way to start the day. With a mug of tea, reading your post and watching the video. Can't wait to get started! Thank you for the PDF! I love your paint stained hands in the video. You have been busy! I am a Close to my Heart Consultant and Cranberry is still available in a pad, reinker, and cardstock, as well as a few other items. Awesome and very helpful as usual. Love that you included a video. Also love how you cut the transparencies and added a tab. Totally going to do that now. I have my entire kit in hand and am getting so excited to start playing. I am one who has a hard time setting up in advance, as I need to see what pictures/stories I have, but it is very inspirational seeing how you have used some of the elements in the kit. I think that I'll emboss all my chipboard numbers like you have, and purchase your combo overlay pack to have some of those printed as well. These things I can at least get ready in advance. LOVE those huge gold chipboard letters and numbers and am so excited to have these to use. I'll also borrow your idea with the transparencies and tabs and paint up the chipboard piece with the holes. But first, need to really clean up my craft space! No,its perfect color for me.I am glad its different.it opens up lot of creative ideas. I sprayed my cover with some dylusions ink spray in postbox red, then a little of heidi swapp's color shine spray in white for a little shimmer. I really love it darker and more of a true red. Fun to be able to transform it how we want. (I put a piece of washi tape over the "december daily" logo on the spine so it wouldn't get colored over. Oh cool - i'd love to see it! hi Wilna.Can I ask you a quick question please?. I bought ur heartfelt christmas class and I am so happy with it.I already did my wreaths.my question is,do you think i can do the album cover like you did using the cut file? Its ali edwards red color album,which is actually light coral kind of red as you know,but its fabric.so how do you glue the cutfile to fabric properly? I received my album Saturday (still no kit) and have the same question as drciri. The album is not red as described but coral. It does say "december daily" on the spine so it probably is the right album but it seems to be an odd color for Christmas. Were they supposed to be red? I can't wait to get started on my December Daily. I have all of my materials and now I just need to set aside some TIME! ...quick question, Ali. Do you wash your stamps in water after each use or do you just stamp them off on a piece of paper to remove excess ink? I stamp them off onto another piece of paper :). I know. I know. I will get back to it :). Hi Ali. Awesome, as always. Any chance of selling more albums? Hi! We don't have any individual ones at this time but plan to have some available in my shop next year. Thanks for the quick response. I just checked my order history and realized I DO have the album for DD. Yeah! It just haven't received it. It was the WITL that I missed out on the album. I'll just hold the contents of that album until one becomes available next year. Thanks, Ali!